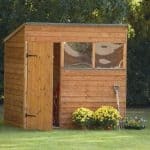 This is an apex shed that also benefits from other aspects. The apex roof means that you have added head height, as well as the ability to store larger tools. The overlap cladding is a great feature too, in that it prevents rainwater from entering the structure and causing damage to your equipment. The 8 x 6 Waltons shed is also windowless. This means that you have instant security, because people will not be able to see inside the building and therefore see the contents. 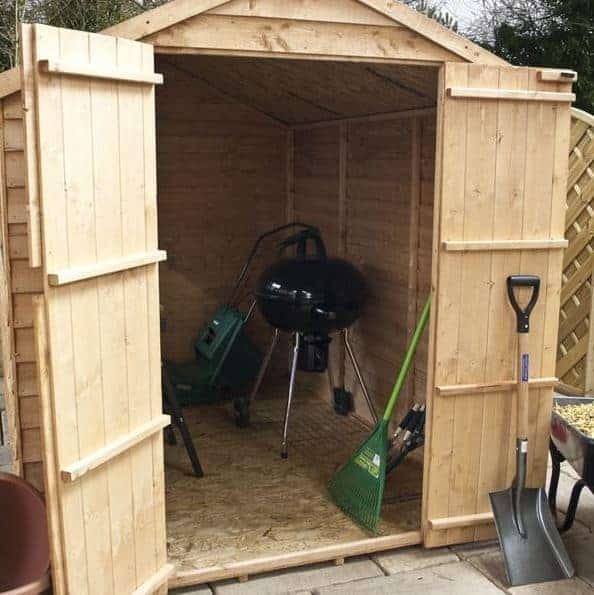 Several upgrades are available for this shed and some can be seen as more important than others. For example, the superior duty felt upgrade can be useful, but it isn’t as important as the extra strength floor support pack. 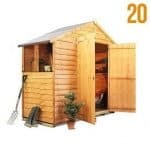 This is because the heavy duty felt included with the shed already provides adequate protection against all weathers. The solid sheet board for the floor however can be problematic if you plan on storing anything heavy. The extra strength floor support pack will give you great peace of mind, while also boosting the stability of the entire structure. The 8×6 Walton’s Portabase is another important upgrade. We recommend no matter what shed you invest in, that you take advantage of the Portabase benefits. This is because in order to give the building maximum stability and durability, it needs to be built on an entirely even, dry surface. The Portabase not only provides that flat surface, but it also ensures the bottom of the shed doesn’t touch the ground. This means there is absolutely no chance it will become damaged over time by damp or rot. An extra that is more of a novelty than something you actually need is the Lean to Kit. 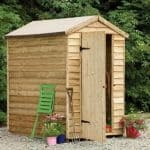 This is both an attractive and practical upgrade for the shed and it gives you a little bit more storage space. 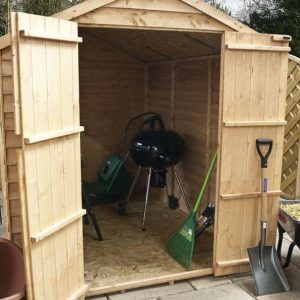 It provides a covered area that can be used to store your garden bin. Just keep in mind that it may be covered but it doesn’t protect anything you store there from the sides. So whatever you do place under the shelter will need to be resistant to harsh weather. 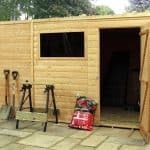 All of the materials used to create the shed have been chosen for their exceptional quality. It is the one thing Waltons never let us down on. When annually treated, the building will effectively withstand light wear and tear and damage from the elements for 10 years at least. 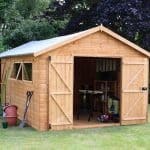 This is really good considering the low price of the shed compared to other buildings. As well as giving you a good sized storage space, there is also the option to upgrade with the Lean to Kit to provide even more storage. If the overlap cladding was strong enough to allow shelving to be installed then it would be better. Therefore we have given this a 7.8/10 rating. 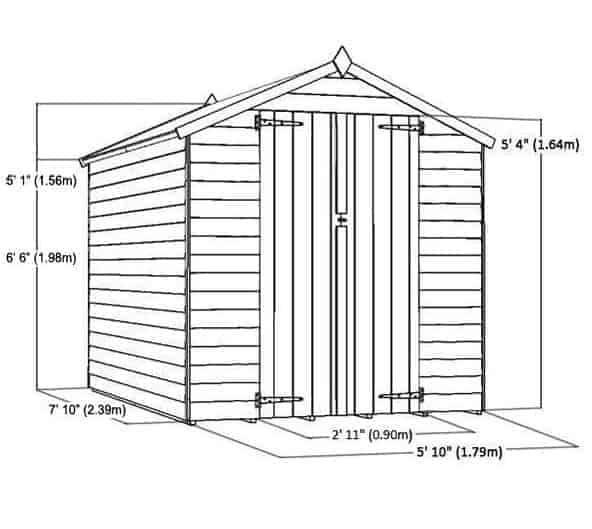 This isn’t a difficult shed to put together but it will require some heavy lifting. As a medium size building, it is advised that two people are used to construct it. You should also expect it to take quite a long time to put up. 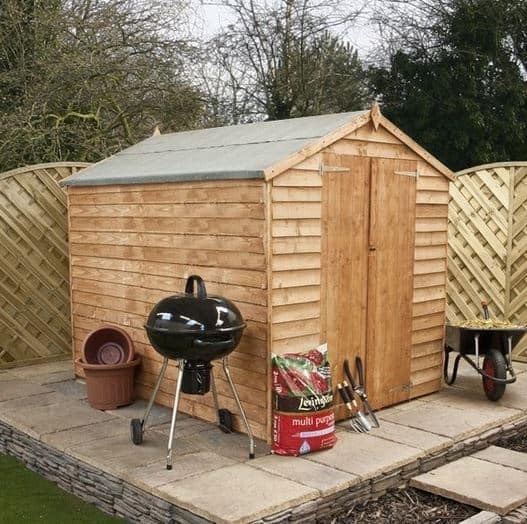 As the shed is made from overlap cladding, you get a solid construction at a low, affordable cost. Due to the fact it does need to be annually treated, we couldn’t give it full marks. Overall though, it does supply excellent value for money. 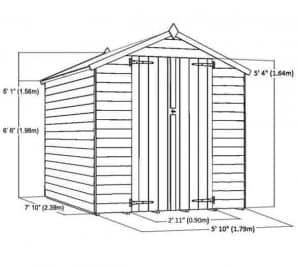 Final Thoughts: The medium size shed offers plenty of storage room and a high quality design. If you spend a little more money on some of the extras, you can also maximise its durability, providing better value for money. 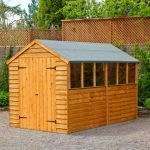 It effectively protects the building from weather damage and despite needing to be treated annually we do recommend this as an overall great all-round shed.